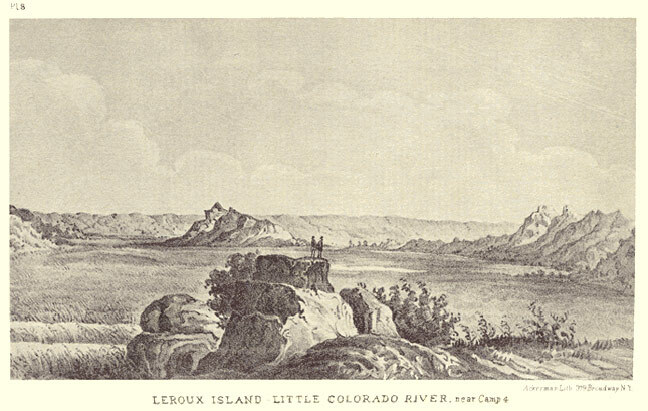 A 40-odd man expedition headed by Captain Lorenzo Sitgreaves marched out of the pueblo of Zuni in eastern New Mexico on September 24, 1851, to see if the Little Colorado River might provide a good way to reach California and southern Utah. After traveling four days down the dry Zuni River, Sitgreaves’ party reached the Little Colorado River near modern Hunt, Arizona. 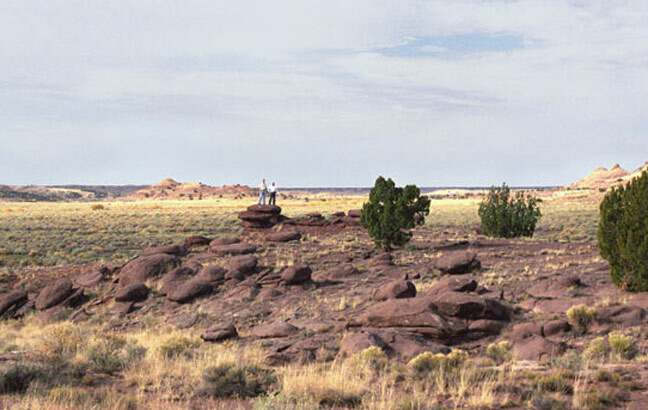 Expedition artist Richard Kern sketched the view to the west from their camp. 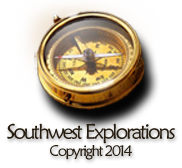 Leroux Island is not mentioned in Sitgreaves’ published journal but the above plate appears in the report. It is also noted on the large map that was published with the report. The “island” today is just a hill in the usually dry river bed. The foreground rock in both pictures is at the western edge of a low hill on the river’s north bank, probably the site of the expedition’s Camp 4. Sitgreaves’ Camp #4. “Leroux Island” is the distant hill left of center. The men on the rock are Andrew Wallace (right) and myself (left). 2002 photo by Tom Jonas and Rose Ann Tompkins. I’d like to comment on a couple of interesting things about these pictures. First, the men in the top picture are too small in scale compared to the actual size of the rock they’re standing on. Second, note left side outline of the rock the men are standing on. The rock in the photograph has the same contour as the bush in the lithograph above. The probable explanation is that the lithographs were done later in Washington from rough field sketches and the lithographer had to fill in details that weren’t clear or weren’t there in the original drawings.